Eight members of Congress and other officials joined Governor Kenneth Mapp and Delegate Stacey Plaskett for a listening session at Juan F. Luis Hospital following a brief tour to assess hurricane damage and the ongoing recovery effort. ST. CROIX, U.S. VIRGIN ISLANDS – The U.S. Virgin Islands requires the help of Congress in order to rebuild a stronger and more resilient infrastructure, Governor Kenneth E. Mapp said Sunday. Speaking to a visiting congressional delegation representing the House Committee on Energy & Commerce, the Governor said that more resources are required than provided for under current laws. Eight members of Congress and several Administration officials visited St. Croix in order to assess the damage to the Territory and the ongoing recovery effort. The Stafford Act affords assistance to rebuild in the event of a disaster, but not necessarily to make any improvements. The Governor is pushing hard to allow enough funding to improve existing infrastructure, particularly the electrical system. He told the members of the Energy & Commerce Committee it will cost $380 million to rebuild the USVI’s electrical system and $850 million to rebuild a system that is much more impervious to storms. The Governor is pushing to have all primary and secondary lines buried underground, to create microgrids and to develop more renewable energy sources. He said such an electrical system would allow the Territory to get quickly on its feet in the event of future disasters, prevent economic disruption and greatly reduce the distress to residents caused by prolonged power outages. Virgin Islands Water and Power Authority (WAPA) Director Julio Rhymer and Energy Office Director Elmo Roebuck echoed the Governor’s sentiments. Rhymer told the congressional delegation WAPA was advocating for both burying lines and the for the use of composite, rather than regular wooden, electrical poles as although they are more expensive, they are built to withstand 200 mile per hour winds. “We want to build a hardened system,” Rhymer said. Governor Mapp also requested that Congress allow for more flexibility in the use of Federal Highway Funds. He explained that as a territory, rather than a state, the U.S. Virgin Islands was limited in the amount of emergency funds it could be granted by the U.S. Department of Transportation and that it would cost upwards of $3 million just to repair the islands’ traffic lights. Governor Mapp’s messages resonated with members of the congressional delegation. Energy & Commerce Committee Chairman, Greg Walden, said that Congress had learned much as a result of the Virgin Islands recovery effort. The delegation toured Frederiksted, stopping briefly at the hurricane ravaged Arthur Richards Junior High School and the solar farms in Clifton Hill and Orange Grove, the latter of which was destroyed by Hurricane Maria despite being further from the eyewall. Governor Mapp has pointed out that the design and construction at Clifton Hill was clearly superior and should serve as an example going forward. 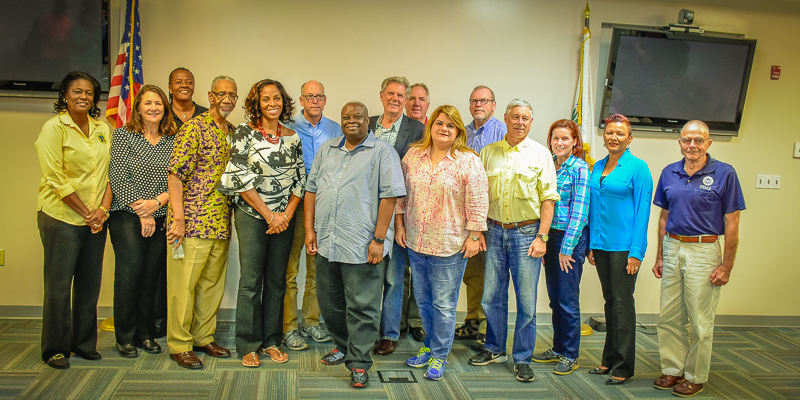 Those visiting St. Croix Sunday included Rep. Greg Walden (R-OR), Rep. Fred Upton (R-MI), Rep. Gene Green (R-TX), Rep. Morgan Griffith (R-VA), Resident Commissioner Jenniffer González-Colón (R-PR), Rep. Frank Pallone (D-NJ), Rep. Bobby Rush (D-IL), Rep. Diana DeGette (D-CO), and Virgin Islands Delegate Stacey Plaskett, whose office coordinated Sunday’s tour.